New Kent's Amya Evans fights the sun and makes a snag in foul territory for a crucial out. Over the course of a year, New Kent’s Lady Trojans softball team has gone from predator to prey. But while many teams would fall under the pressure of being hunted, the 2019 edition of the Lady Trojans continue to elude the traps set by their opponents, including one with a Friday encounter with the York Lady Falcons. 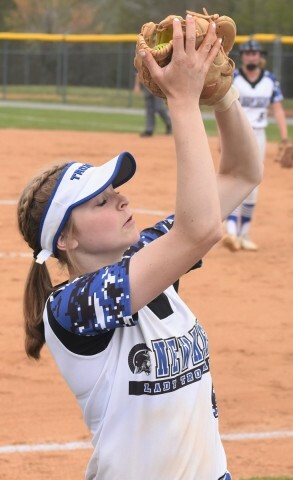 A combination of defensive highlights along with 12 strikeouts from pitcher Gracie Ellis, New Kent emerged with a 2-0 victory in the Bay Rivers contest, remaining undefeated in the district while improving its record to 7-1. Haley Cleaver’s connection at the plates continued, as she helped orchestrate runs for the hosts. Meanwhile, the story of the game were defensive grabs as K.B. Snyder and Amya Evans made crucial snags to halt momentum by York. Ellis continued to provide strong pitching antics for the Lady Trojans. Along with her dozen strikeouts, she limited York to a mere three hits. The defense rallied behind the sophomore pitcher, who has sent 69 batters this year back to the dugout courtesy of strikeouts. New Kent Head Coach Maria Bates talked about the continuous challenges from competition every day her team takes the field. “You will have slumps during the season, and we are just going to work through it,” she said. “These are competitive games, so you are going to have those tight games at times.